Russian officials on Tuesday cautioned against expecting a breakthrough in its territorial dispute with Tokyo when President Vladimir Putin visits Japan this week, and proposed focusing instead on commercial deals. Japanese Prime Minister Shinzo Abe has pledged to resolve the dispute over who has sovereignty over a string of islands in the Pacific Ocean, and said he hoped for progress when he hosts Putin, reports Reuters. But a deal to end the row, which has soured relations since the end of World War Two, carries political risks for Putin, who does not want to tarnish his image at home as a staunch defender of Russian sovereignty. Kremlin spokesman Dmitry Peskov echoed that sentiment, and cautioned against limiting the agenda between Moscow and Tokyo to just the islands dispute. Russia is hoping to land deals with Japanese companies as part of a pivot towards Asia in response to the decision by Western governments to impose sanctions over Russia’s role in the Ukraine conflict. “The potential in our relations is so rich, and the desire is so great to develop our relations to the level where they meet their potential, that we don’t want to concentrate on one issue but on the wider substance … of our relations,” Peskov said. The territorial feud has blocked Moscow and Tokyo from signing a peace treaty to formally end World War Two hostilities. The dispute stems from the Soviet Union’s seizure at the end of the war of four islands off Hokkaido, known in Japan as the Northern Territories and in Russia as the Southern Kuriles. Putin’s visit is his first in years. 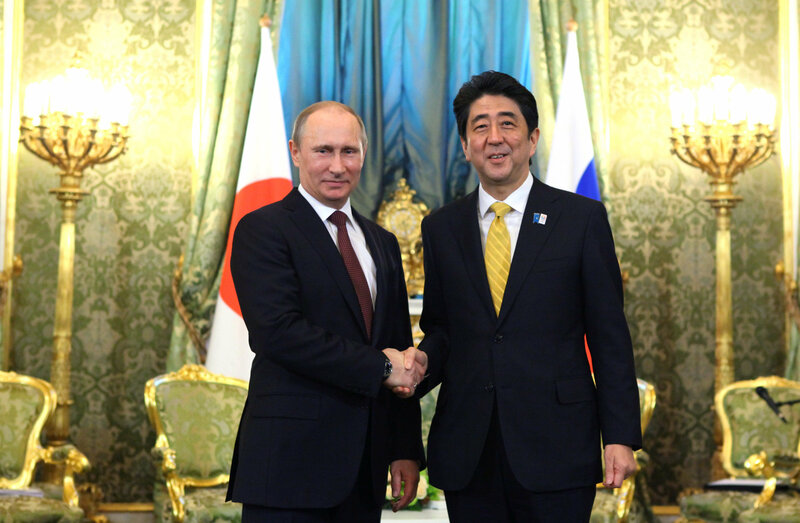 Abe and Putin meet on Dec. 15-16, first in Abe’s constituency in southwest Japan and then in Tokyo the next day. In an interview with Japan’s Yomiuri newspaper in advance of the visit, Putin said that Moscow and Tokyo needed to agree on conditions for a peace treaty based on trust and joint economic activities. “The absence of a peace treaty between Russia and Japan is an anachronism left over from the past, and that anachronism should be removed. But how to do that is a difficult question,” Putin said, according to a transcript released by the Kremlin. He said the task was made harder if Russia remained subject to Japanese sanctions, imposed on Russia in tandem with the Western sanctions over Ukraine.